A pair of durable, hi viz work trousers to GORT 3279. 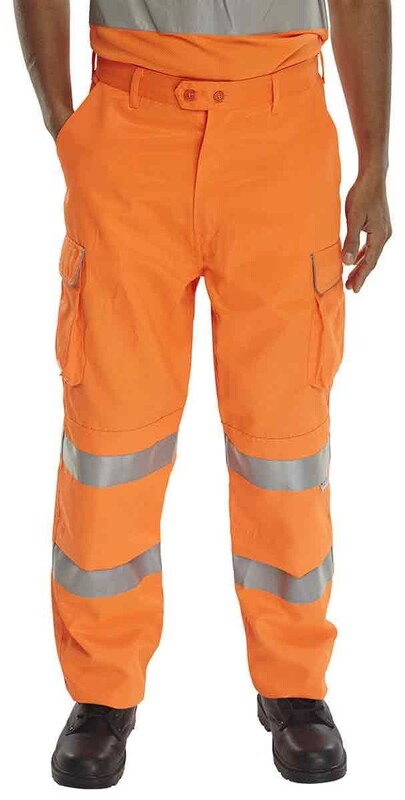 The B-Seen Rail Spec Work Trousers are Orange Hi- Visibility poly cotton work trousers, to Rail Spec GO/RT 3279. 80% Polyester 20% cotton gives hardwearing qualities whilst remaining soft and comfortable. Hard wearing and durable with Teflon coating to aid soil release when washing. Short leg: 29", Regular leg: 31", Tall leg: 33".